CRAIC Technologies, the worlds leading innovator of UV-visible-NIR microspectroscopy solutions, is proud to announce availability of the 308 PV™, a UV-visible-NIR spectrophotometer for your microscope. The 308 Perfect Vision™ is designed to be added to an open photoport of a microscope or probe station so that you can non-destructively analyze the spectra of many types of microscopic samples. Featuring CRAC Technologies' cutting edge Lightblades™ spectrophotometers and proprietary optical interface technologies, the 308 PV™ can acquire spectra of microscopic sample areas by absorbance, reflectance, polarization, luminescence and fluorescence, in addition to high-resolution color images, when attached to properly configured microscopes. Applications are numerous and include characterization of new materials, measurement of surface plasmon resonance, graphene, vitrinite reflectance of coal and high resolution colorimetric and relative intensity mapping of flat panel displays. Thin film thickness of microscopic areas can also be measured using the 308 PV™. Combined with CRAIC Technologies Traceable Standards, which are specifically designed for use with microspectrophotometers and traceable to Standard Reference Materials from NIST, the 308 PV™ spectrophotometer is a cost effective micro-analysis tool for any laboratory or manufacturing facility. The 308 PV™ spectrophotometer is an all manual system that integrates CRAIC Technologies Lightblades™ spectrophotometer with a sophisticated optical interface hardware and powerful, easy-to-use Lambdafire™ software. Lightblades™ are spectrophotometers designed and built by CRAIC Technologies specifically for microscale analysis. This new level of sensitivity and stability give us a flexible yet rugged instrument that is designed to add to a microscopes' photoport and rapidly acquire high quality spectra from microscopic samples. Sophisticated software, high resolution imaging, permanently calibrated variable apertures and other innovations all yield a new level of sophistication for microanalysis. 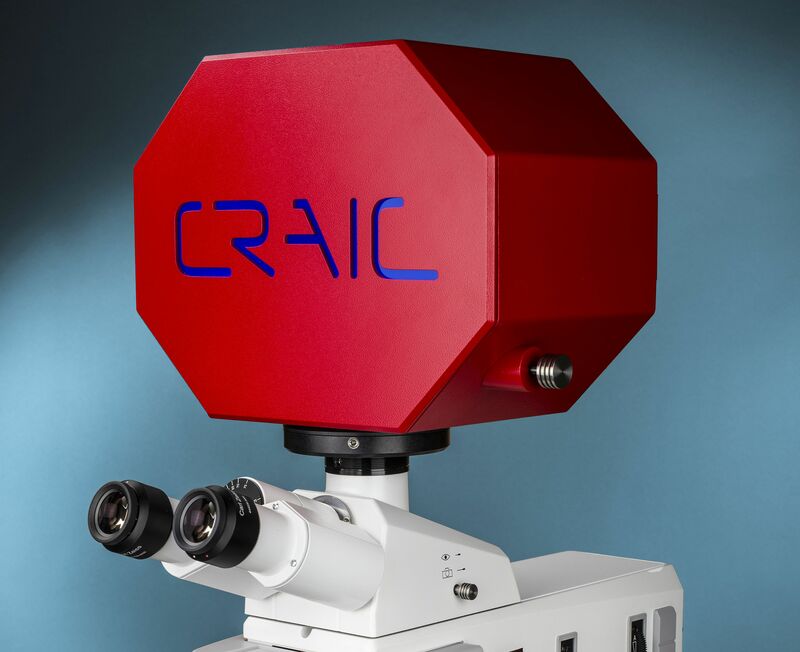 Featuring a durable design yet offering high sensitivity, ease-of-use, imaging and spectroscopic techniques and the support of CRAIC Technologies, the 308 PV™ is more than just a scientific instrument…it is a great solution to your analytical challenges.